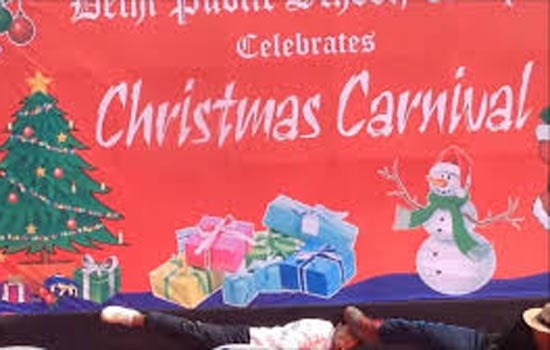 Delhi Public School, Udaipur celebrated this year with the 'Christmas Day' pompously like every year. The Christmas carnival was organized at the school premises. In the fair form, the fair was inaugurated with a Christmas rally. Inauguration of the fair carried out byMr. Bhawani Singh Detha, and District Collector, Udaipur Shri Vishnucharan Malik, by cutting ribbons. Special guest MPUdaipur Mr. Arjunlal Meena, Superintendent of Police Mr. Rashtraideep, District Education Officer, Shri Naresh Ji Dangi and famous personalities of the city boast of the show. The school student orchestra band welcomed them with a melodious tune. In the order of reception, the students of class 3 to 5 have taken the mind of everyone with the song dance rallies. The students in which they wear roughly apparel wear a ramp walk. One-on-one presentation of adorable songs-dance has been enhanced. Seeing the viewers, the viewer could not even stop his feet from stopping. There were stalls of various sports stalls in which Lucky Deep, Seven-Up Seven Down and Card Games, Balls In-A Bucket, Fishing Shooting were the main ones. Apart from this, terracotta stalls were also installed under horse riding, camel rides, children's train, clay modelling. On the other hand, the taste of delicious dishes was viewable. People enjoyed the dishes in the winter sunshine. For the young women interested in make-up, the 'One Art Corner' was the center of attraction. There was a considerable crowd on this counter. Apart from this, the audience also enjoyed the taste of delicious songs. A lucky draw was finally removed. At the end of the program, Mr. Govind Agarwal, Chairman of the school, Principal Mr. Sanjay Narwariya Principal Mr. Rajesh Dhabhai HM and Mrs. Shalini Singh delivered the proceedings in their own capacity.